There is currently just the 1 ferry route running between Sark and Jersey operated by 1 ferry company – Manche Iles Express. The Sark to Jersey (St Helier) ferry crossing operates weekly with a scheduled sailing duration from about 1 hour 10 minutes. Whilst we’ve taken great care to ensure the information on this page is correct, as the frequency and duration of crossings on all routes can vary from time to time we’d advise that you get a live quote for current availability on this Sark Jersey crossing between Sark and Jersey (St Helier). 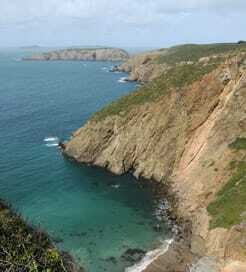 Sark is the fourth smallest of the Channel Islands in the English Channel, just off the Normandy coast in France. On arrival, you’re met by towering cliffs topped by steeply sloping land covered in bluebells, thrift and daisies. As well as natural beauty, Sark boasts an incredibly tranquil atmosphere thanks to the absence of cars on the island, earning it the nickname ‘the crown jewel of the Channel Islands’. Sark has even been awarded for its exceptional quality of unpolluted darkness, providing unbeatable night sky views, so be sure to take an evening stroll. The surrounding waters offer great conditions for sea kayaking and bodyboarding, too, so there’s plenty of activities to enjoy. Sark is a useful gateway to the neighbouring Channel Island of Jersey, the largest of the archipelago, with frequent sailings departing the main port on the east coast lasting around 80 minutes. The beautiful island of Jersey is the largest of the British Channel Islands, a British Crown Dependency just off the coast of Normandy. 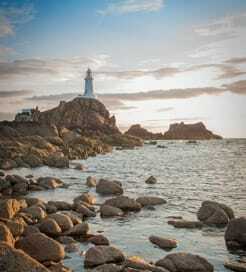 From the quaint fishing villages and golden beaches on the coastline to its unspoilt countryside, narrow country lanes and cosmopolitan harbour town, the most southerly of the Channel Islands, Jersey, has much to offer with its fine blend of the best of England and France.